Whether your gutters are literally falling off the side of your house, or you’re just interested in learning whether your current gutters are effectively doing their job, it can never hurt to contact a gutter replacement company in Minneapolis. At Minnesota Leafless Gutters, we have decades of experience providing our customers with all types of gutters for their homes and commercial properties. • Gutters Protect Your Foundation – Your foundation is likely one of the most important components of your home. Water pooling at your foundation can lead to major foundation issues as well as to moisture making its way into your home, which is always a bad idea. Gutters and downspouts help to route water off your roof and away from your foundation. • Gutters Help Prevent Erosion – Imagine a strong rain storm and you have no gutters. Water literally pours off your roof directly onto the soil around your foundation. Over time this pooling of water can lead to erosion around your foundation, which is never good news, especially when the grade around your home should always be pitched away from your foundation to prevent flooding. 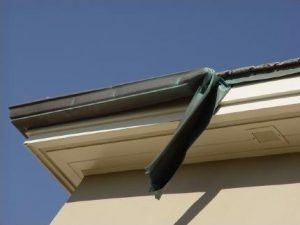 • Gutters Protect Water Cascading Over Doorways – Most people forget when they remove their gutters that whenever they walk into their house during a rainstorm, they’ll likely encounter water pouring off the house and onto their heads as they’re attempting to open their door. This is a rather unpleasant experience, which can all be avoided with properly functioning gutters. At Minnesota Seamless Gutters, we would be happy to come out to your property to provide you with a free gutter replacement estimate. We use only the highest quality gutter materials to ensure they’ll last for years to come. By using seamless gutters, we’re able to cut down on many of the gutter problems we encounter. Older gutters tend to leak at the seams, which is impossible thanks to our seamless gutter technology. To learn more about the different gutter colors and materials available from Minnesota Seamless Gutters, give us a call today at 612-221-0362.